The facial features and biography of Haile Selassie, or “Tafari Makonnen Woldemikael”, raise many suspicions. They might indicate there is some non-African origin in his blood. Could it be his hooked strange nose and big ears of Asiatic invaders? [Who was Emperor Haile Selassie’s mother? Politics, ethnicity and religion have always been interwoven in Ethiopia, which is why Haile Selassie never wanted to reveal the full identity of his mother. “Who was Emperor Haile Selassie’s mother?” is the title of this Amharic article. This is a controversial topic that many Ethiopians feel uncomfortable to talk about due to its political heaviness. The article discusses how the emperor and writers of his biography never revealed his mother’s full name or her photograph in public during or after his reign, deliberately due to the sensitivity of the issue. Why was it sensitive and why was the mother’s identity hidden from the public unlike the emperor’s father? Simple answer: Because her religious and ethnic identities would have been obstacles to Haile Selassie’s ascent to power. In addition, the emperor’s mother had no royal lineage, but his father Ras Makonnen was a general and governor himself whose parents, though they had mixed heritage, were descended from nobility, which helped the emperor claim the throne. According to the article: 1) The emperor’s mother had a mixed ethnic background, just like many Ethiopians; she was half-Gurague and half-Wara Iluu; thus, far from the then dominant ethnic group, or ruling class, the Amhara. 2) Her father was a Muslim. Orthodox Christianity was the de-facto official religion at the time. Think of President Barack (Hussein) Obama for a second and how the US media and the Republicans play with his middle name and mixed background, especially when he visits conservative states. That was, perhaps, the kind of scrutiny that the Emperor wanted to avoid when he guarded his mother’s identity. The emperor’s mother was called Yeshimebet Ali Gamcho. Yeshimebet is a Christian/Amharic name; Ali is Muslim; and Gamcho is ethnic/non-Amharic. Haile Selassie’s royal line (through his father’s mother) originated from the Amhara people, He was born on 23 July 1892, in the village of Ejersa Goro, in the Harar province of Ethiopia. His mother was Woizero (“Lady”) Yeshimebet Ali Abba Jifar, daughter of the renowned Oromo ruler of Wollo province Dejazmach Ali Abba Jifar. His maternal grandmother was of Gurage heritage. 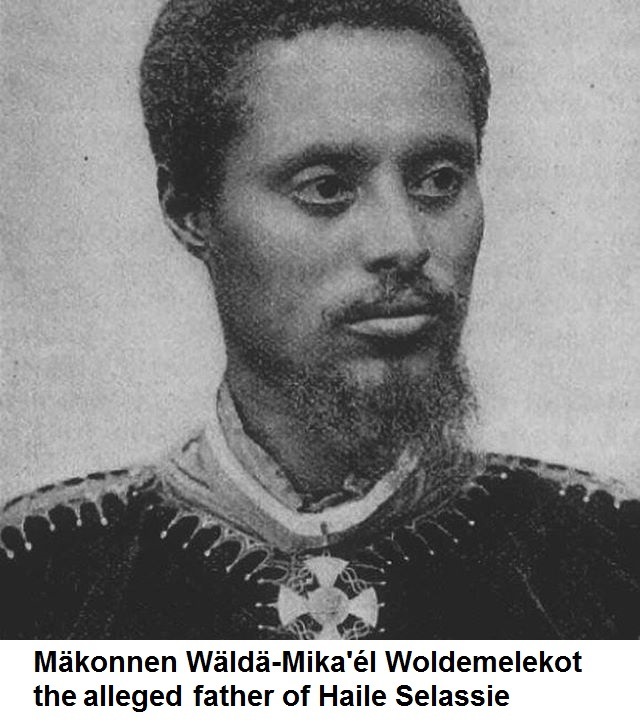 Tafari’s father was Ras Makonnen Woldemikael Gudessa, the governor of Harar. Yeshimebet Ali, daughter of Woizero (later Immabet-Hoy) Wolete Giyorgis and Dejazmatch Ali Abba Jiffar, who was a Muslim chief of the Warra Illu clan of the Wollo Oromo tribe, and a former trader from Gondar. Was she a legitimate child? Yeshimebet Ali Abba Jiffar had eight miscarriages before giving birth to Haile Selassie. This is weird and the child doesn’t look like his official father (Mäkonnen Wäldä-Mika’él Woldemelekot). 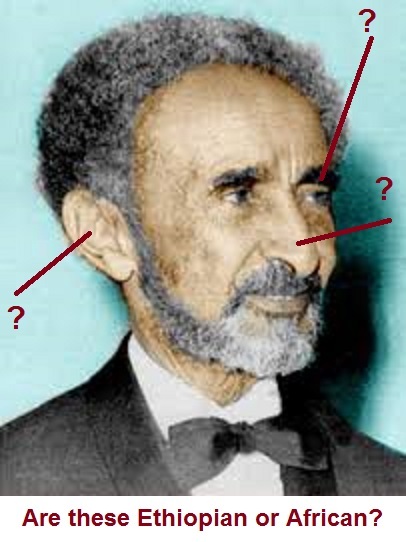 Asiatic features of Haile Selassie also looks like that of Al Saud and the Emiratis. Look at his “father’s” nose, ears, and eyebrows. This is a controversial topic that many Ethiopians feel uncomfortable to talk about due to its political heaviness. The article discusses how the emperor and writers of his biography never revealed his mother’s full name or her photograph in public during or after his reign, deliberately due to the sensitivity of the issue. The Israelites are from around Harar; but Haile Selassie could be of Turkic Mongolian father which is Jewish and not Israelite. An Ethiopian commented saying: [Yes indeed somebody told me that his Pakistani dad mate with his Ethiopian mother .his Pakistani dad was in Ethiopia for some reason to do something and this brings me to have suspicious that he had some Turkic Mongolian race through his Pakistani father. If you look his non biological father on picture there is no way he looks like him. The Pakistani man of Selassi biological father used to go secretly and mate with Selassi’s mother weyezero (native honored name given to married woman) Yeshmebet. This happens when Ras Mekonenen goes for mission outside of the city of Harar in Ethiopia]. This could lead to a very serious conclusion that is the Turkic Mongolian Jews destroyed and stole once again the history and the identity of Israelites. This time with just one woman and her illegitimate child. The real Exodus of 1446 BC was within Punt only and it was not from Punt to Yemen. It was from Gondar to Simien Mountains where Moses received the Ten Commandments and the Torah. They crossed a wide wild river only, but not a sea. The broken tablets must had been moved in the Arc of Covenant to a desert new home of Israelite, which could be in the Afar Triangle or Rift Valley. 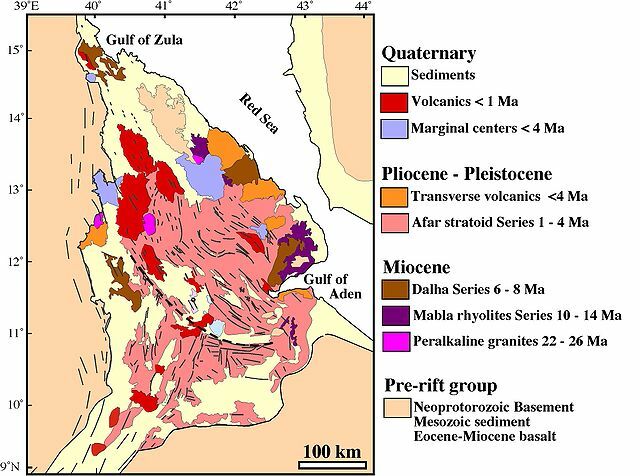 A simplified geologic map of the Afar Depression. Here there must be a lot of gold from which King Solomon got his wealth. Haile Selassie’s mother full name is Yeshimebet Ali Abba Jifar. Embarrassing or ethnic/non-Amharic name was not the reason at all to hide her biography. Most probably Yeshimebet Ali had had shameful past and that is why he tried to conceal her history. Many indications show that Haile Selassie was a criminal, a traitor, a fake figure, illegitimate child and power grabber. 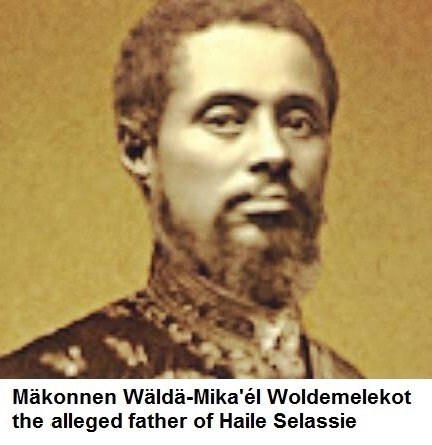 Not only the origin and motives of Haile Selassie, or “Tafari Makonnen Woldemikael” were dubious but also his accession to power and the deaths/killings of the conservative Empress Zewditu and her husband Gugsa Welle. He was implanted by Jews and he served them, because his real father was not Ethiopian, but a Turkic Mongolian. He killed, starved, stole, oppressed, corrupted, divided, and impoverished Ethiopia and Ethiopians. Did Tafari know the true story of Abraham, Joseph, Moses, or the Exodus? Did he challenge the numerous unfounded tales and myths of Judaeo-Christiaty or the Roman Vatican? Did he tell his followers and subjects the difference between Israelite and Jews? Did he know the truth about the Hebrew Bible and the lost sheep o Israel and reveal it? Off course he didn’t because he was part of the Turkic Mongolian global frauds. Wake Up Ethiopians! DNA analyses of Jewish communities worldwide have confirmed that today’s Jews are related to each other and originated in the Middle East. Among other things, the “from the Khazars” canard has been conclusively debunked. A 2013 study of Ashkenazi mitochondrial DNA found no significant evidence of Khazar contribution to the Ashkenazi Jewish DNA, as would be predicted by the Khazar-canard. Although there is no historical or DNA evidence to support the Khazar idea, it (of course) stays popular among anti-Semites. The Hebrew Israelite are the Lost Sheep o the House of Israel.